I have a habit. Once I get through a heavy hitting drama(s) I like to take a week off, drama free, and We Got Married heavy. I pick a couple, take a Saturday, and marathon away. That is how I have found out how daebak a lot of the season one couples are and realized how some subsequent couples pale in comparison (in the interesting department, anyway). As every faithful WGM viewer knows, almost every couple is at one time or another subjected to a super awkward and squee-worthy wedding photo shoot. How the couple handles it…well that is what makes this show interesting. Note: I am going to ignore how a WGM photo shoot usually signals the end of the couple. Yes, in fact I am in denial. Thanks for asking. I have never really considered each couple’s wedding pics in comparison, however season four recently gave everyone a license to judge. 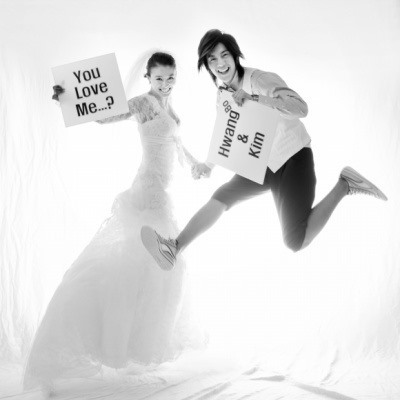 Season four’s couples had a contest to see who had the best pictures (the winning couple were featured on the WGM homepage). So with all of the voting and wedding pics and such I got to thinking…what were the best We Got Married pictorials of them all? Here are my favorites. Let me know yours- I love a good We Got Married discussion. Cheers! There was something super sweet about these two, and I think their wedding pictorial captures this vibe to a tee. WGM’s first noona- younger man couple showed a playful and beyond endearing look at how age can be tossed out the window when a couple has fun. Their wedding photos seemed to convey their unique chemistry. The first real life couple of WGM (at least real life prior to the filming of the show) is still going strong. I love these two and love their dynamic wedding pictorial even more! This couple was pure gold. I have never laughed so much while watching WGM. Just looking at their wedding pictorial makes me smile- I think that their pics convey this couples push and pull and hilarity extremely well. The.End. This is my favorite couple of all time. There is something sweetly innocent about this pairing, I can’t get enough! Their photo shoot seems to capture their onscreen relationship without missing a beat- from music to just plain cute I love how their pictorial showed their adorable side. SuJu’s leader finds a wife, and I am still spazzing over this pairing. Absolutely love them. I feel like their pics are representative of their quirky but endearing on-screen marriage. Traditional with a little bit of the fairy tale concept their photo shoot was representative of their onscreen marriage. This couple has received a lot of hate as of late, but I find them just as endearing and watchable as ever before. Love their high fashion concept photo shoot- I think it really highlights this duo and their too cool for school vibe. A real life couple, these two are extremely endearing with all of their quirkiness. I really like their pictorial concept, I feel like it showcases their eccentric persona’s. I think that is the best I have ever seen Lee Teuk! I liked all of season 1 wedding pictures. I was really in love with the casual look of Crown J and In Young’s because of her shoes…. I love Shoes! I agree- Lee Teuk has never looked so good. I have not watched a lot of Crown J and In Young- how are they as a couple? Crown J and In Young are the epitome of the song “break up to make up”. I still loved them. In the first season, all the couples were perfectly matched! I love, love, love SHOES! I just bought these shoes with a gift card my friend gave me. I heard that In Young is still trying to live down the reputation she earned as part of this couple, I am going to have to watch them soon to figure out what it is all about. I am more of a purse girl myself, my sister called dibs on shoes. But they are super cute! 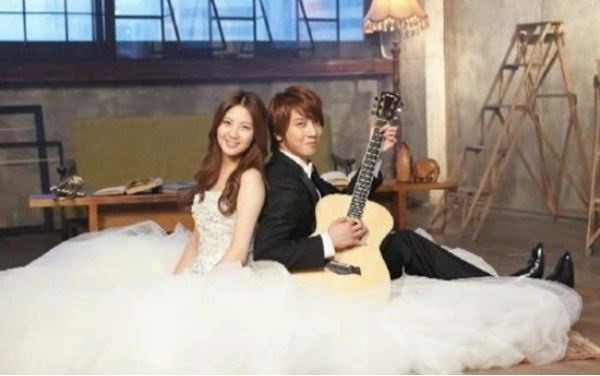 i only love to see these 2 couple, yongseo and alshin couple….these 2 couple life in wgm really real!! !yongseo of course pure and innocent couple,,alex n shin ae really sweet n romantic…<<33 but why alshin couple not really popular?? for me as a whole, i think hwangbo-hyunjoong photo are the most dynamic.. second gain-jokwon, but i really love jinwoon-joonhe gum’s pic, really editorial. 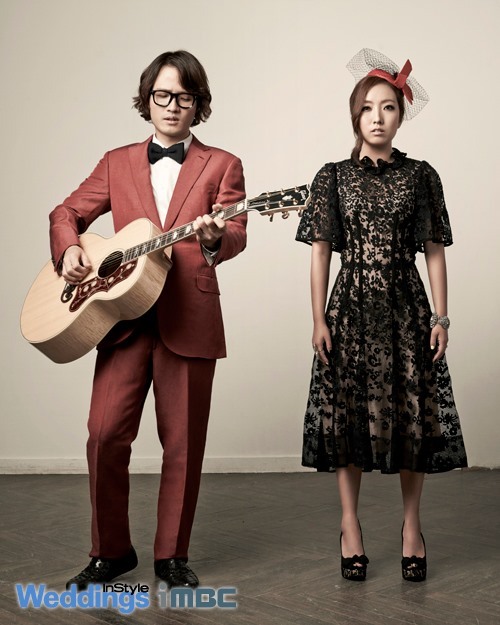 Andy-solbi’s are really sweet. I really like season 1 couples, the ant and the witch.. oh my god i love their bickering.. for alshin, they are really dreamy for the first 7 episodes but after alex comeback theirs just kinda obvious.. i’m not really anticipating.. I need to find a link to watch.